Trumpeting Elephant Shape Address Plaque - - personalized silhouette address plaque in the shape of an elephant in motion and with his truck raised. Calling jungle animal aficionados and everyone with an interest in the most majestic of land animals (or anything unusually large). Made in the USA. Wall mount address sign custom made with your address number and color choice. The Elephant is also suitable for lawn mount using the optional Comfort House Address Sign Lawn Stake. Click top link in Related Products to learn more about the lawn stake. One-line street address sign holds up two (2) 4" characters or three (3) 3.5" characters. 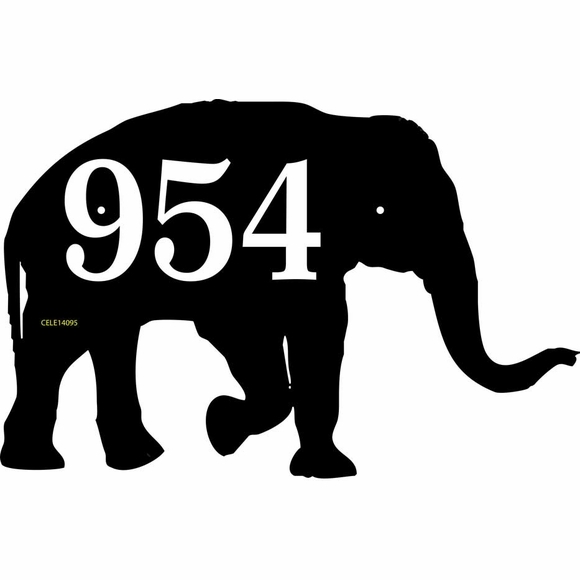 Note: style number visible in the sample is not engraved on your elephant. Made from sturdy and UV-stabilized, non rusting, laminated acrylic with engraved personalization. Characters are permanently engraved into the silhouette during the production process. Dimensions: 14"W x 9.25"H x 1/8". Laminated acrylic special shape address plaque crafted in the USA.